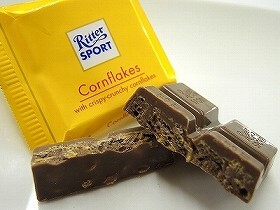 Milk Chocolate with corn flakes(7%). 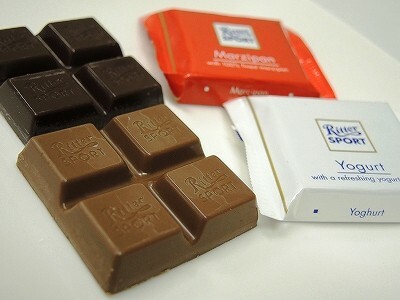 Milk chocolate: Cocoa Solids 30% Minimum, Milk Solids 18%, Minimum. 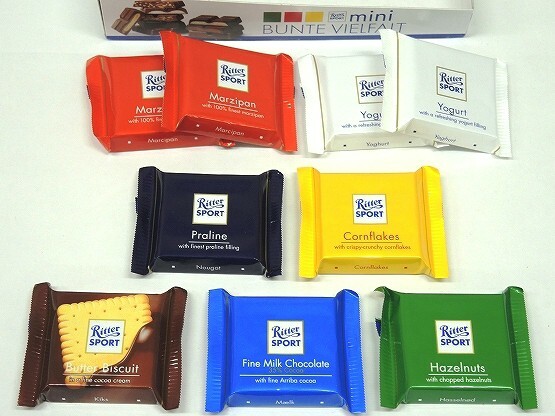 Ingredients: Sugar, Cocoa Mass, Corn(6.5%), Lactose, Emulsifier(Soya Lecithin), Salt, Barley malt, Natural Flavouring. 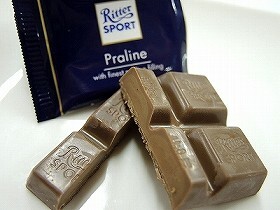 Praline with finest praline filling. 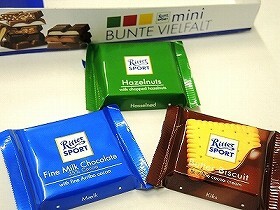 Milk chocolate with praline filling(42%). 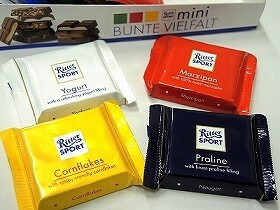 Milk chocolate: Cocoa Solids 30% Minimum, Milk Solids 18%, Minimum. 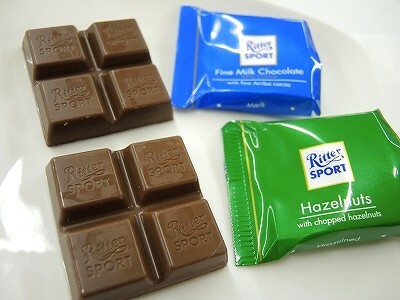 Ingredients: Sugar, hazelnut Paste(18%), Cocoa Butter, Cocoa Mass, Milk Powder, Lactose, Skimmed Milk Powder, Butterfat. Emulsifier(Soya Lecithin), Natural Flavouring. 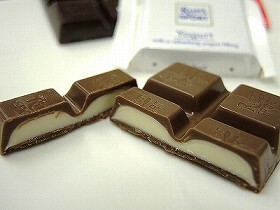 Filled milk chocolate with skimmed yogurt cream(44%). 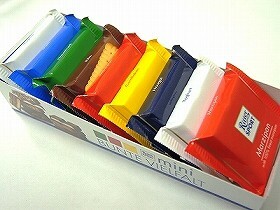 Milk chocolate: Cocoa Solids 30% Minimum, Milk Solids 18%, Minimum. Ingredients: Sugar, Vegetable fat, Skimmed Milk Yogurt Powder(12%), Cocoa Butter, Cocoa Mass, Milk Powder, Butterfat, Emulsifier(Soya Lecithin), Natural Flavouring. 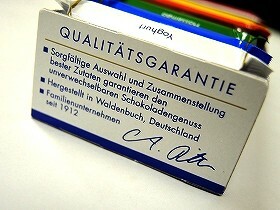 Marzipan with 100% finest marzipan. 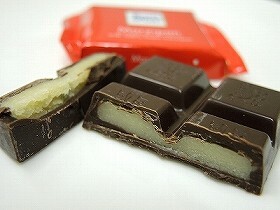 Plain chocolate with marzipan filling(40%). 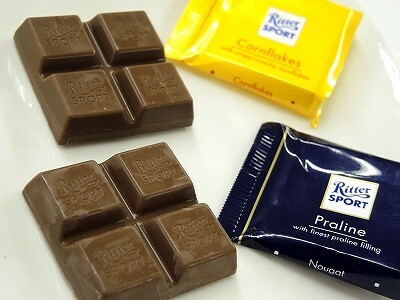 Plain chocolate: Cocoa Solids 50% Minimum. 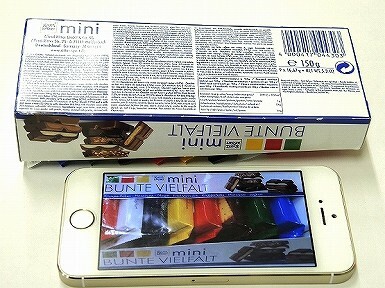 Ingredients: Sugar, Cocoa Mass, Almonds(15%), Cocoa Butter, Invert Sugar Syrup, Emulsifier(Soya Lecithin), Natural Flavouring. 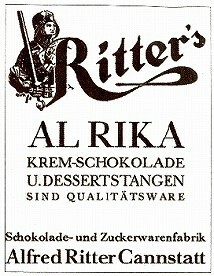 Fine Milk Chocolate 35% Cocoa with fine Arriba Cocoa. 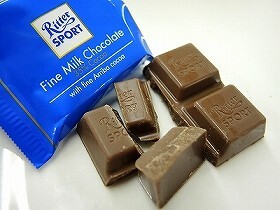 Fine milk chocolate. Cocoa Solid 35% minimum. 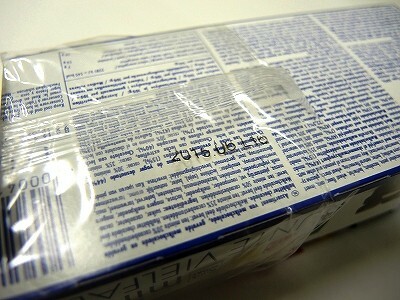 milk solids 18% minimum. Ingredients: Sugar, Cocoa Butter, Cream Powder(13%), Cocoa Mass(Thereof Flavour Cocoa 40%, Skimmed Milk Powder(5%), Lactose, Butterfat, Emulsifier(Soya Lecithin), Natural Flavouring. 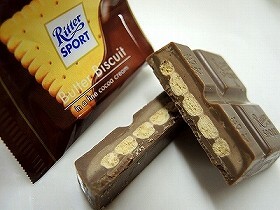 A butter biscuit(13%) and a milk and cocoa cream(22.5%) in milk chocolate(64.5%). 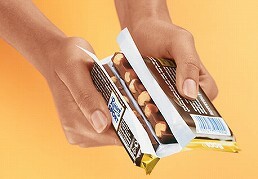 Milk chocolate: Cocoa Solids 30% Minimum, Milk Solids 18%, Minimum. 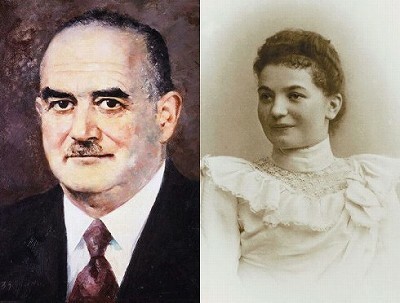 Ingredients: Sugar, Cocoa Butter, Vegetable Fat, Cocoa mass(9.6%), Wheat Flour, Lactose, Milk Powder(6.8%), Skimmed Milk Powder, Butterfat, Cram Powder, Butter(1.2%), Emulsifier(Soya Lecithin), Wheat Starch, Glucose Syrup, Salt, Natural Fravouring. 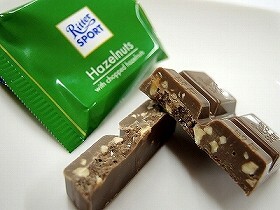 Milk chocolate with chopped hazelnuts(15%). 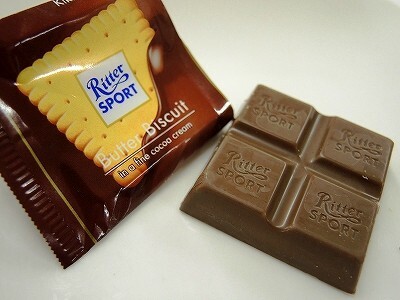 Ingredients: Sugar, Cocoa Butter, Hazelnuts, Cocoa Mass, Milk Powder, Lactose, Skimmed Milk Powder, Butterfat, Emulsifier(Soya Lecithin), Natural Flavouring. 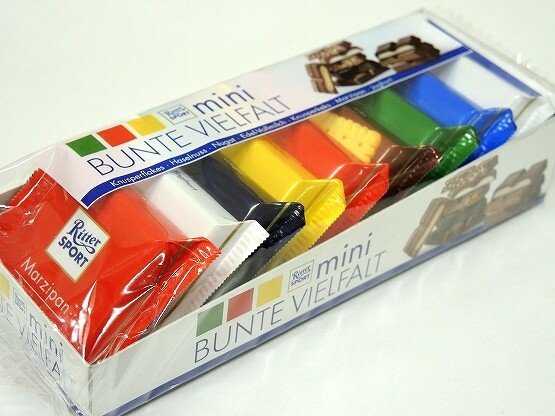 メーカー Alfred Ritter GmbH & Co. KG.